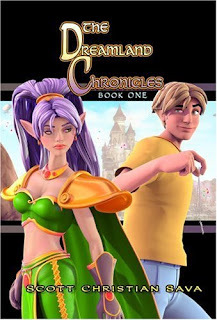 Originally a web-based comic (which has been offered as a free e-book via WOWIO or can be viewed at The Dreamland Chronicles weblog) launched in 2006, THE DREAMLAND CHRONICLES has recently made its way to the printed page in book form. It's clear that Sava works hard to reach out to his audience, asking advice for characters and for his illustrations as the stories develop. This connection with his readers brings an interesting twist to THE DREAMLAND CHRONICLES and demonstrates Sava's understanding of audience. According to Wikipedia, Sava's story series has been nominated for numerous awards and won Best Graphic Novel of 2006 in Comics Buyer's Guide's 25th Annual Fan Awards. THE DREAMLAND CHRONICLES is rich with characters – from Nastajia, the elf princess, to Paddington, the rock giant – and Sava has done well with developing their personalities from the start. Not everyone in these stories likes Alex and Alex himself comes across as a mixed character – full of flaws and yet full of potential, too. Alex's brother, for example, sees both the elf-centered side of Alex and wishes that he were the one to enter Dreamland, and not Alex. But he also is in awe of Alex's abilities and yearns to hear more of the stories of adventure that Alex tells. There are some subtle, yet truthful, sibling dynamics at work between these two brothers. Sava also wisely creates both strong female and male characters, allowing girls as well as boys to enter the story with a sense of identity. In addition, Sava has created a series of web-based comics that bring the reader inside the creation of the comic itself (available as a free e-book downloads through WOWIO ). Sava has embedded video into these tutorials, and he talks to the reader about the use of software to create a graphic story. These behind-the-scenes comics allow young writers and artists to watch the creation of characters and story on their screens, with Sava talking them through his process and thinking. The reader can literally watch the mouse clicks that Sava makes to change a view or character. This alone makes THE DREAMLAND CHRONICLES a must-read for the classroom of young writers and creators. My sixth grade students were completely engaged in Sava's explanation behind the creation of his comic books and they had more questions than I had answers about how technology can be used for writing and illustrating a book. Next year, I may just direct them to Sava's blog, where he takes the time to answer questions from his readers and engage them in conversations about the story. Click here to read the review of Sava's other title, ED'S TERRESTRIALS. I'm honored to be your first review on the Graphic Classroom site! Thank you for the kind words and throrough review! I'm actually amazed at how much your students enjoyed the making of videos. I guess now I have to go do more. Thanks again and welcome to Graphic Classroom. Administrator's note: Several comments have been removed because they were spam.